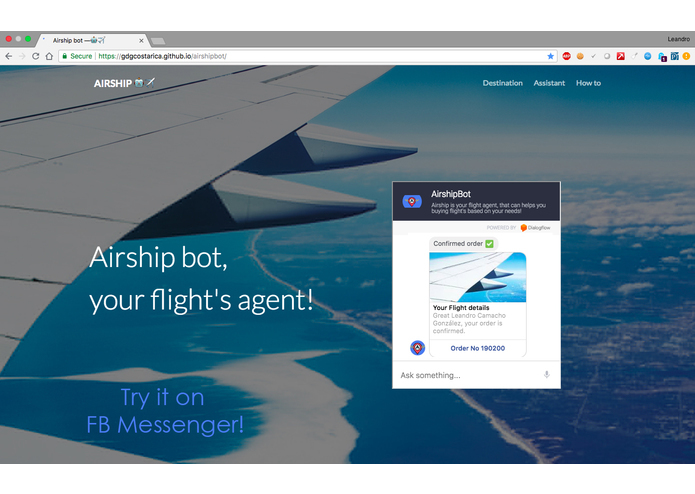 Try Airship bot on FB Messenger! 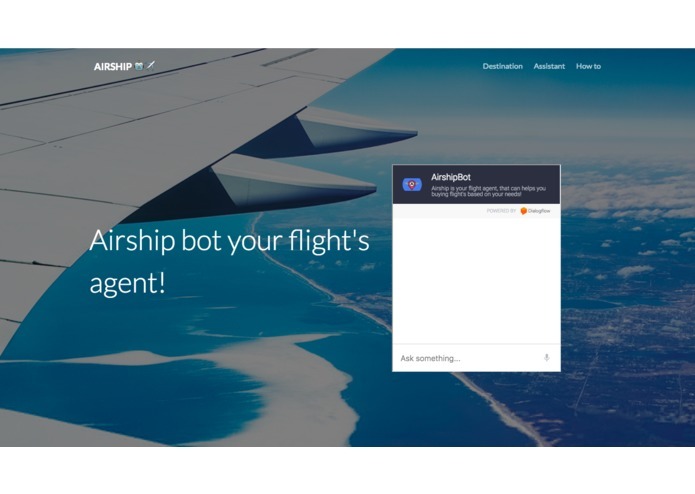 "According to legend, when Airship bot was born, he flew to where thunder and lightning are released" Assistants & machine-learning solutions are disrupting the Travel sector, through automated solutions that are always looking for the best option for each user in an interactive and personal way. 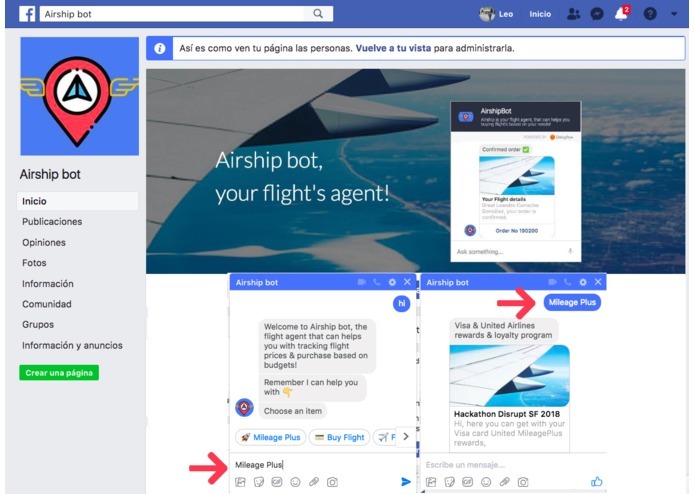 We also got inspired by the 1.3 billion people who use Messenger every month and the 8 billion messages that are exchanged between people and businesses each month. 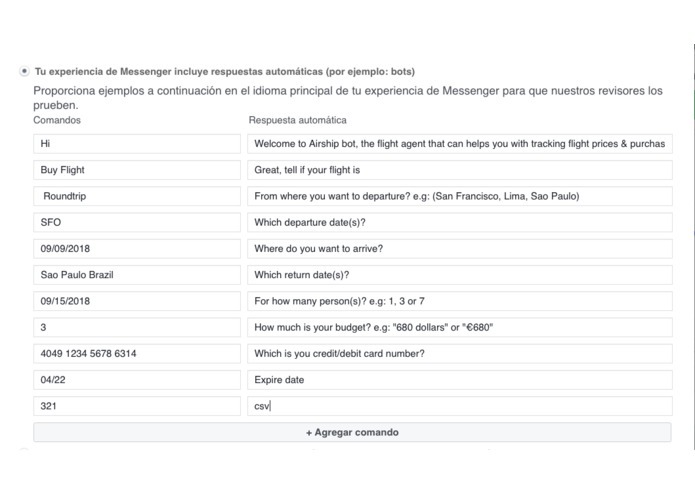 The solution is a mashup between the integrations of different APIs: for the payments we will use Visa APIs, for the speech recognition we use Google Speech API, for the Natural Processing Language (NLP) we use Actions on Google, and for flights data we will use United Airlines API. 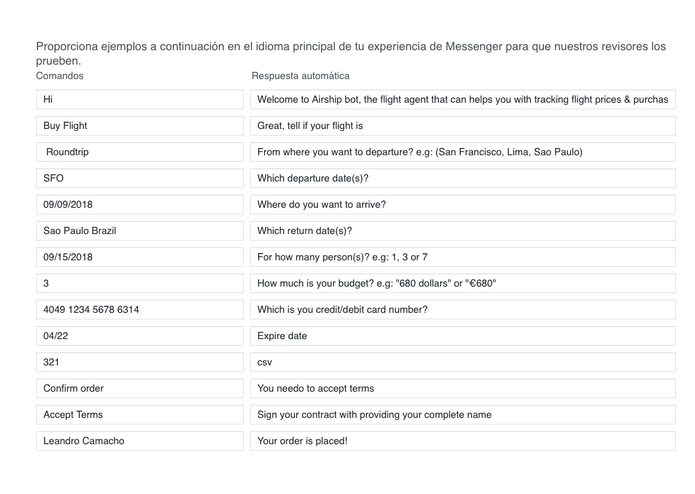 All of this APIs, integrated through cloud functions to our back-end in Firebase and FB Messenger. The time frame for the challenge is short, so you have to invest really good your time, and develop killer app functionalities that feets the users needs and goals. That in order to build great things, you need to be decide to face every single challenge you can find on your way. Also, our team learned that businesses and customers now exchange 8 billion messages a day on Messenger, up from 2 billion from last year, and finally that Messaging apps now have the largest numbers of active users, having overtaken social media apps in 2015, as well that Facebook Messenger has a one billion strong user base. Furthermore, we learned about the transformation that is passing through the Travel Industry with the incorporation of artificial intelligence, smart speakers & apps that seem poised to become the world’s virtual travel agents. According to the Harvard Business Review: "The adoption of smart speakers is even outpacing that of smartphones a decade ago: An NPR-Edison Research study found that 18% of adults in the United States, or 43 million people, now own a smart speaker. Worldwide, ownership exceeds 100 million units and is projected to reach 225 million by 2020". Be one of the prestigious members of the Visa Developer & United Airlines communities, to keep opening opportunities in different challenges, keep trying deeper assistants functionalities for the Travel sector, and focusing on the most relevant actions for our user's daily lives.